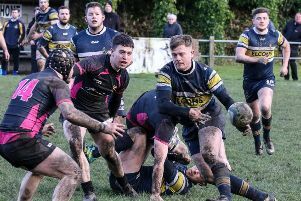 Old Rishworthians’ superb defensive display earned them two well-deserved points in a 20-20 draw away to Bradford Salem. That could prove crucial in their bid for survival in Yorkshire One, although other results proved unfavourable and saw them drop into the bottom two. For 25 minutes at the start of the second half they were pinned into their own 22 by wave after wave of attack from Salem. It seemed they had to cave in from the constant pick and go tactics of the big home pack, but they held firm. Twice Salem got over the line, but each time they were held up and then Rishworthians disrupted the scrum possession. Three times they conceded penalties near their own line and each time Salem elected to go for pushovers rather than kicks. Each time the visitors’ pack held firm, disrupting the possession and once even taking the ball against the head. It summed up Rishworthians’ collective spirit, which was coupled with some individual moments of skill, especially a brilliant try from fly half Ed Cockroft. They might even have snatched the game in the final minute but Josh Kelly’s penalty kick from the halfway line dropped short in the difficult wind. Early in the game the visitors went down to a penalty kick, but came back strong, with scrum half George Wright keeping the ball moving well and kicking them into a good position. 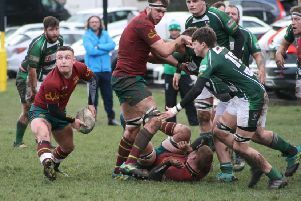 Throughout both sides dropped the ball several times and from an early knock-on Rishworthians won the scrum and took the ball on with prop Phil Kershaw taking it over the line for his fourth try of the season. Cockroft added the conversion. They kept Salem in their own half for a long period with aggressive defence. Eventually they won a scrum near halfway and the ball came out to Cockroft, who spotted a gap and set off on a weaving run, leaving defenders in his wake to score a brilliant individual try and then add the conversion. It seemed to spur on the home side and they came back strongly to score a converted try from a drive through after a quickly taken penalty. Rishworthians now found themselves under constant pressure and conceded another converted try to go 17-14 behind. As the half ended, an excellent turnover was created in the Salem 22 by centre Ben Waud and wing Doug Heseltine. It led to more Rishworthian pressure, gaining a penalty, which Cockroft kicked to level the score at the break. The second half was all about defence as Salem threw everything at them but the tackling was superb and the defence was highlighted by two excellent turnovers won by replacement Greg Day and great recovery work by wing Jordan Bloem. With only a few minutes left Salem finally decided to kick a penalty, which looked likely to win them the game. But Rishworthians restarted well and won a penalty of their own for Kelly to level the scores. There was barely time for anything else although they gained another penalty on halfway and the only option was to go for goal. In the end though a draw proved a fair result.